Life for a certain kind of tiny invertebrates is possible in space. 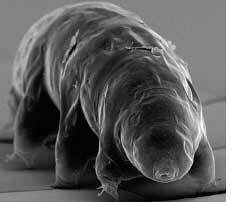 About 1.5 mm long water bears were found to survive there, a European Space Agency (esa) experiment showed. This makes the eight-legged invertebrates, also called tardigrade, the first animals known to survive the harsh combination of low pressure and intense radiation. Scientists from Sweden's Kristianstad University launched two species of tardigrades in space. After 10 days of exposure, the satellite carrying the tardigrades returned to Earth. The tardigrades were then tested to find out how they reacted to the conditions in space, as well as ultraviolet radiation from the sun and cosmic rays. The vacuum seemed to have little effect on the creatures. Ultraviolet radiation though took its toll.In one of the two species tested, 68 per cent of specimens that were shielded from higher-energy radiation from the sun revived. Many of these tardigrades then lay eggs that successfully hatched. But only a handful of animals survived full exposure to the ultraviolet light. The results, however, said little about how the animals might develop and reproduce in harsh environments. Before this, only lichen and bacteria were known to survive in the combination of vacuum and space radiation. Scientists are preparing to launch a new satellite to make precise measurements of the Earth's gravitational field. This torpedo-shaped satellite, they say, will improve predictions about global warming. The aim of the us $475 million project is to help scientists improve their predictions by enabling them to produce a precise picture of ocean currents--flows that transport vast amounts of heat around the planet and impact global climate. They will do this by comparing the surface shape of the oceans with the undulations in the gravitational field. The satellite will complete a map of the gravitational field once every 70 days and operate for about 18 months. Geologists are expected to use the map for reference points to measure movements during earthquakes. A compound found in broccoli may limit the risk of developing a chronic lung disease. It does so by increasing the activity of a gene in the lung cells, which protect the cells from toxins. The finding may lead to useful treatments for mapping lung diseases such as chronic obstructive pulmonary disease, said scientists at Johns Hopkins School of Medicine at Baltimore, usa. They found that the compound sulforaphane was able to restore reduced levels of the gene nrf 2 in cells exposed to cigarette smoke. Sulforaphane was also found to be protective against damage to blood vessels caused by diabetes. Earthworms can now be used to help plants clean up soil faster. Researchers at Reading University at Berkshire in the uk have found that subtle changes occurred in metals as earthworms ingested and excreted soil. These changes make it easier for plants to take up toxic metals from contaminated land. Earthworms are ideal soil detectives and have evolved a mechanism that allows them to survive in soils contaminated with toxic metals including arsenic, lead, copper and zinc, the researchers said. They found that properties of metals in the material excreted from earthworms were a little different from those found in the rest of the soil. Some plants can pull out toxic metals from the soil and incorporate them into their tissues, from where the metals can be removed. But this process can take a very long time. 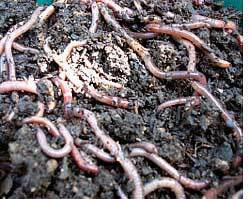 Earthworms make the metals more readily available to plants, speeding up the process. Genetically engineered bacteria could make biofuel cheaper to manufacture. Ethanol from cellulose, the kind of sugar in cornstalks, is considered a green alternative to fossil fuels. The genetically engineered bacteria were able to ferment cellulose to produce ethanol more efficiently than current methods, said researchers of Dartmouth College, New Hampshire, uk. The finding could help unlock more energy from the waste products of farming and forestry. Naturally occurring bacteria can also ferment cellulose, but they do it at lower temperatures and require the use of an enzyme called cellulase. The newly engineered bacteria can ferment all the sugars present in biomass at 50C, compared with conventional microbes that cannot function above 37C. At 50C, the fermentation process required two-and-a-half times less cellulase in one controlled experiment. A new vaccine was found effective against breast cancer in mice. The vaccine targeted breast cancer caused by an excess of protein and destroyed tumours resistant to drugs. Researchers of Wayne State University in Michigan, usa, said the vaccine might be used to prevent the initial development of tumours. But some scientists are of the view that the vaccine was at a very early stage of development and that more studies need to be conducted to find out if it works in human beings.